Truck engine blowby reducer; control in minutes. Last for years. Diesel Truck Engine Blowby Eliminator from Mega Power. Just add and drive to reduce blowby negatives. Blow-by engine trouble is as serious a motor problem as you can have. It overfills the crankcase with fuel and combustion which forces itself out of the engine as an oily discharge. Sucked back into the combustion cycle, performance and power suffers severely. Repair cost for overhaul can run over $5000. A good size chunk of money for anyone to come up with, for sure. However... Mega Power Engine Treatment for Blow-by is coming to the aid of truck owners with this problem. It is helping to keep combustion escape down to a minimum and push overhaul years into the future. Is that the help you are after? Mega Power fills wear gaps on pistons. and cleans and free dirty operating piston rings. Mega Power ends sluggish closing valves ending blow-by from this source. The above can be reduced by our additive. And rarely, when a seal allows pressurized intake air to leak into the crankcase. This last problem requires seal replacement. Our Additive will end the dirty condition for protection of the engine. That's how Mega Power's Engine Treatment reduces blow-by. Under $500 or $5000 which? When your motors pistons upward compression squeezes fuel pass those 3 negatives. more and more fuel - ready to burn, and combustion out into the motor oil section of your motor - then out leaky places all around the motor. Pass the piston's rings into your motors's oil area where it makes sludge. See picture. OK! So what does your fix do others don't to stop blowby? The real fix is a new engine. Cost $4000 to $6000. 50 Weight motor oil doesn't seem to help. Several sticky, honey-like additives brands work. They thicken oil acting as a seal to limit blowby considerably, but add to an already gooey mess. We like Mega Power. It's works in a better way! Mega Power cleans and frees sticky rings and valves. Cleaning and freeing rings and valves allows the rings to expand outward again to keep combustion on top of your pistons. Reducing blow-by that way. And by adding a co-polymer film to worn cylinder walls it limit blow-by that way. Mega Power's treatment will re-power your engine and perhaps offer years more usage for you - who knows? Our customers say so. ! And bring back great fuel economy. Lets get that engine going and making money, not costing you money by in stalling Mega Power in it. Order Mega Power now to get your rig rolling down the road running great again. Save yourself a bunch of cash doing so! Mega Power comes as a 5 pak gallons with directions and phone help. Shipped to your door by FedEx in 3 days. One Engine Treatment for Blowby from Mega Power. 5 items needed. Just $399 plus $50 s&h plus $35 tax total $484. click cart button to order. Truck engine blowby picture show 3 places Mega Power Slo-wear Engine Treatment Product Ends Blowby. 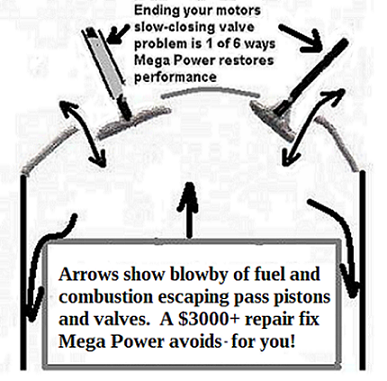 One Engine Treatment for Blowby from Mega Power. 6 items needed. Just $399 plus $50 s&h plus $35 tax total $$484. Order 2 treatments for your other truck, 12 items just $600 total to your door. Save $368 with our fall special as long as 50 sets are still not spoken for. Seems pricey but look what it saves you on actual repair cost! Order One Engine Treatment for Blowby from Mega Power. 6 items needed. comes with directions. Phone help if needed, delivered to your by FedEx in 3 days. Just $399 plus $50 s&h plus $35 tax total $$484. Now: $100 off Special. Today just $384 total. Click cart button to order now. Price subject to change back without notice! Additives are a temporary fix compared to a new engine. Mega Power is almost as good as a new engine - but way cheaper. Your engine still has lots of life in it. And our Mega Power just makes it work much better and the improvement last for years! STP and Lucas use to be helpful with their molasses like goo gumming up spaces to limit blow-by, but today's close-tolerance engines can't tolerate the oil delivery blockage STP and Lucas can cause. To Solve the STP and Lucas gooey thick problem a whole new breed of water thin chemical based additives was invented to stop blow-by in the rings, wear space, and sticky valve are. As a mechanic my choice for an additive has to be darn good to not have customers complain. This new motor treatment from Mega Power ends truck engine blowby in minutes. Last for years. Easy to add. Cheap, too! Not nano ceramic, nor Teflon, nor sticky, not thick, not a solvent cleaner. Engine problems are the result of synthetic motor oil and fuel IN-ability to NOT clean up the residues they help create. Acids in your fuel, 1,800 degree combustion temperatures, and sticky rings and valves all help create a carbon layer int he air, combustion, exhaust systems. Each or any of those sub-systems that become dirty causes lower horsepower development - by becoming a blotter soaking up fuel and making your fuel burn wetter. Wetter fuel does not burn completely and reduces the possible horsepower it can produce. So, you press the gas pedal down a bit more to feed more fuel into the combustion process, to compensate for the lower horsepower output. Fuel economy drops a bit, of course. Acids etch the piston and cylinder walls - the cause of electrolysis and holes in radiators, head gaskets, and cylinder sleeves. Acids and blowby sludge your motor oil, cause more carbon to mix with your motor oil, and weaken your motor oils film strength. More friction from metal-to-metal contact occurs. You lose 5% to 10% of your horsepower at any given time.Mega Power uses MC+ to stop acid damage, and metal-to-metal friction, the worst, most destructive type of friction. If its a new company truck - no problem. If its your older truck, and you want a cheap fix, you should re-read this page and order the products suggested to extend your trucks life and avoid a premature overhaul need. This page, details truck engine blowby. Although its slanted to a car motor problem - the blow-by remedy is identical to your big truck or equipment wear and blow-by lending problem.